Are LED Screens Weather Proof? All outdoor screens are specifically designed to stand harsh outdoor temperatures, rain, hail or snow. We provide screens that are IP65 rated for weather. These screens are designed to withstand the Australian weather conditions. The LED Screens can be controlled remotely. There are many variations of technology that are used to send the imagery to the screens remotely. Some use RF, GPRS or 3G/4G or any other network technology to connect and upload the image files. The internet can be used to connect to the screen. There are proprietary software or generic software such as LED Studio that are used to program the screens. One can use a desktop or a laptop using internet or some other connectivity to connect and upload the image files to the screen. 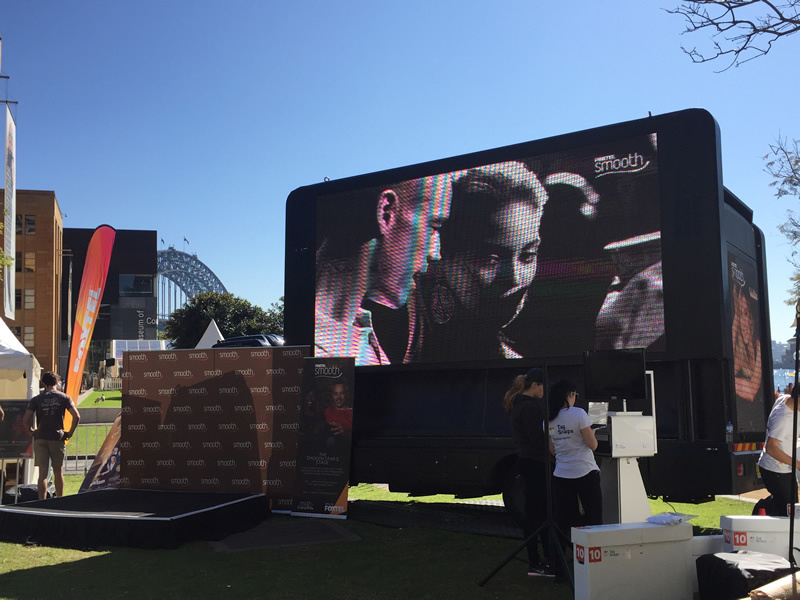 We offer a complete range of LED screens for displays, mobile screens and LED screen billboards. The LED Screens can be customised to any size and orientation to suit many applications. And much more… We deliver any screen for your project. The term Pixel Pitch is a distance between the center of two adjacent LED’s. e.g. P10 pixel pitch LED screen would have a 10MM distance between the two cluster of LED’s. Each cluster of LED would consist of three RGB (Red, Green, Blue) LED’s in a conventional screen and same applies for the SMD screen. Viewing distance is the minimum distance from the screen for optimal viewing; P10 screen would have 10 Mts of minimum viewing distance and so on. LED’s have evolved and revolutionised the lighting industry with energy saving lights and have been put to many other uses in various industries. LED technologies have evolved from standard cluster of red, green and blue to Surface Mounted Diodes (SMD). Most modern screens and lighting use the SMD modules. Conventional LED’s are however better in brightness, colors, life and are used for most of the outdoor LED screens such as outdoor billboards and or mobile LED screen vehicles. SMD’s are used more for indoor screens.